You sure look that way... What happened? Is that why you're tired? Got it. You mean donuts, right? This is just between you and me, but I found frozen donuts in the storage room back at the dorms a while ago. Try imagining them, the moment they go into the microwave! Try imagining those hot, steaming donuts! You wanna eat them, don't you! You wanna eat them too! You really do like Donuts, don't you. Is there anyone who doesn't?! The entire world... no, the entire universe loves them! My body itself feels like it's about to melt! It's such a wonderful feeling! Just like I'm falling straight down the donut's hole! I believe it's scientifically known as "donutification". ...No, you just made that up. I can't take it anymore! I'm drooling like the Niagara falls over here! Naegi! Step aside! If you're in my way, I'll trample you down!! I'm coming, o God of Donuts! 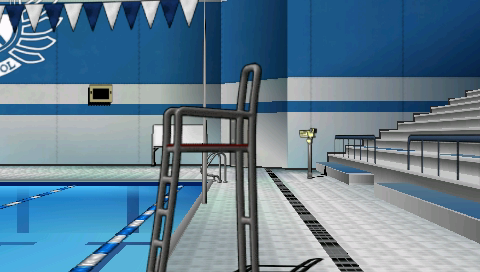 Asahina-san didn't waste any more time, and ran away full speed. When I'm talking with her, I feel... how should I put it? The vitality of human life. Do something, Naegi. I'm really hungry! Um, what exactly am I supposed to do about it? I wanna eat something... I'm so hungry I could eat paper. ...How about donuts? That's what you usually eat, isn't it? I...I can't!! Donuts are my secret weapon for rainy days! If I ate them all the time, I'd just end up chubby! I guess it's natural she'd feel this way. She's an athlete, after all. Also, I don't feel like something sweet right now. I want a salty snack. That's not a snack, you know. It isn't? What is it, then? But, more importantly, what kind of ramen do you like, Naegi? ...She really is a girl after my own heart. ...So I guess you don't care that much about calories after all. Y'know, you ask them to put some extra pork fat in it? And then you add some butter? It's so good! ...Doesn't the oil harden it? ...Are you sure? Even donuts are less fattening! Don't be so petty! You're a man, aren't you? Did you get intimidated because I'm a girl who likes ramen?! I've had enough! Step away!! Or maybe you want me to kick you?! Are you standing in my way so I can kick you?! Don't try to stop me! One has to live the moment! Yelling at the top of her voice, Asahina-san ran into the kitchen. She's... scary when she has food on her mind. My body is too heavy! There's no doubt about it! This is bad... Real bad!! But, what if I'd get even fatter after that...?! I don't even see anything different about you, you know. You're lying. I'm obviously much rounder than before. Would you say I have... a "nice body"? Really?! Are you sure you don't just need glasses? No, I think my eyesight is fine. ...But I can't get too comfy! It's decided! 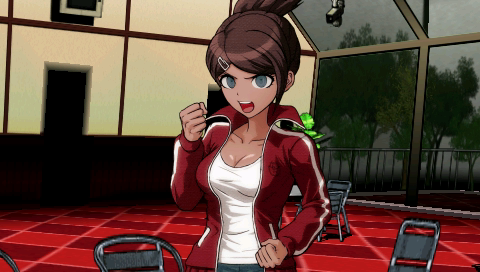 Starting today, Aoi Asahina goes on a diet! I'll show you! I'm going to lose tons of weight in no time! It's no use trying to stop me! I've already decided! I have iron willpower, y'know! I'll go stuff my body with donuts one last time! As soon as she finished talking, Asahina-san dashed out of the room full-speed. 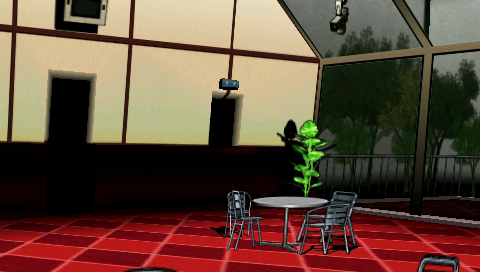 Hey, Naegi... Do you have a minute...? T...This place is no good! Can you come to my room later? I'll see you then! Don't forget! 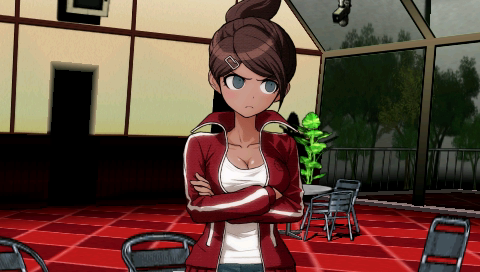 Asahina-san ran away without waiting for an answer. What's up with her? Why is she inviting me over so suddenly? I guess I'll have to go and see. 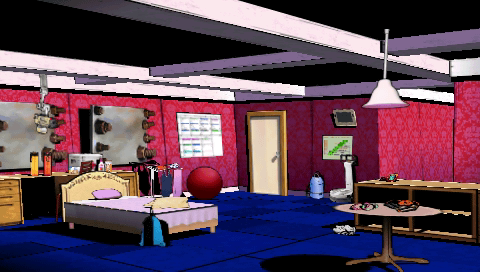 I did I was told, and went to Asahina-san's room. It's fine, I don't mind. What's up? 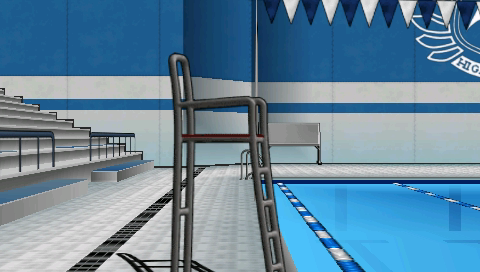 There's something I want to ask you, Naegi. I want an honest answer, okay? What... do you think about me? I mean...... as a woman. ...I mean, why are you suddenly asking me that?! I've always been told I don't act feminine enough. I mean, I don't think they're wrong... I don't really care about anything but sports, after all. But, I think part of it is that I've never been in love. I've never been in love, and that's why I can't act like normal girls do. I want you to be my boyfriend, okay? Ah! Don't get me wrong! I'm not talking about a real boyfriend! I just want to practice! I'm not feminine because I've never been in love, but I can't get a boyfriend because I'm not feminine. That's what they call a vicious circle, isn't it? So I made a plan to get a practice boyfriend to bring my femininity into the surface! After I do that, I'll be able to fall in love for real! So, please! Will you be my practice boyfriend? You're the only one I can ask, Naegi. Please! It's just for a little while! ...So, what should I do? Oh, whatever. Let's just begin. ...Welcome home, dear. Do you want dinner? Should I prepare the bath? 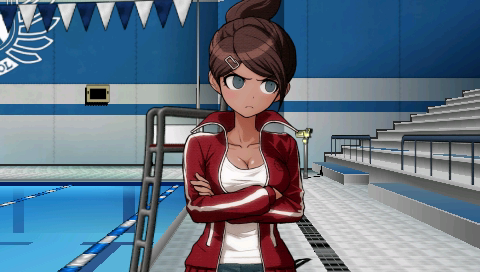 Asahina-san... I think that's more a housewife than a girlfriend. ...Eh? I got it wrong? You've been deceiving me, haven't you?! You told me you were going to divorce your wife!! I think that's... even worse. You mean, I can't even get it right while practicing? I'm really that much of a failure?! W...What am I going to do? At this rate, I'll end up being lonely my entire life! You don't really need to practice, do you? 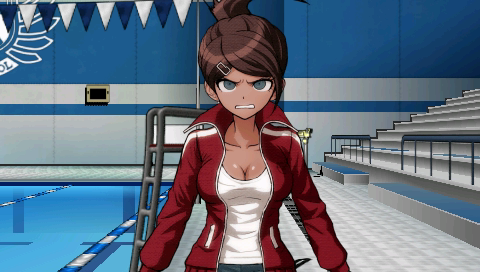 But, isn't that exactly what's so appealing about you, Asahina-san? If you try to force a change, you won't be yourself anymore. I think you're fine just the way you are. 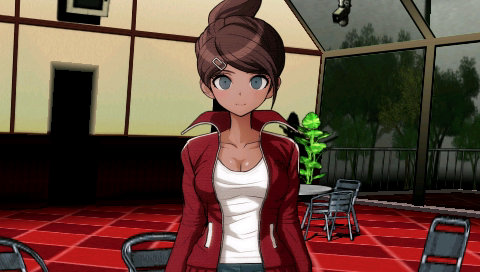 I mean, that's who the real Aoi Asahina is. Love is supposed to be fun, right? But, not being yourself isn't fun at all. 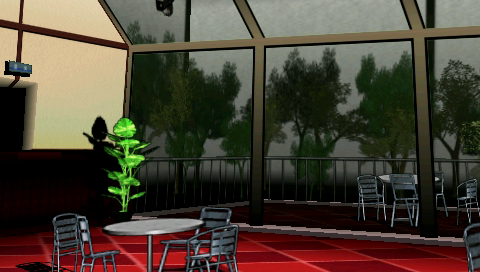 I think I can believe it... because it's you speaking, Naegi. I'll just have to wait until fate brings a cool guy to me! Someone like Jason Statham! So she likes them rough... I don't think she should count on fate. Thank you, Naegi! Somehow, you managed to say just the right words! And, y'know? It was kind of fun, practicing with you. ...Ha ha, I'm just joking! 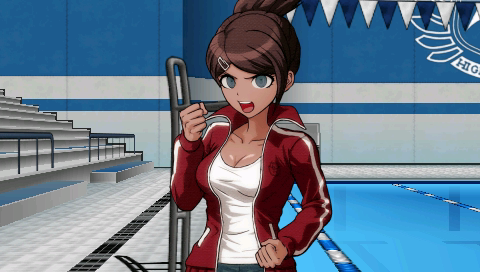 But, joke or no joke, I think I can really call Asahina-san my friend. 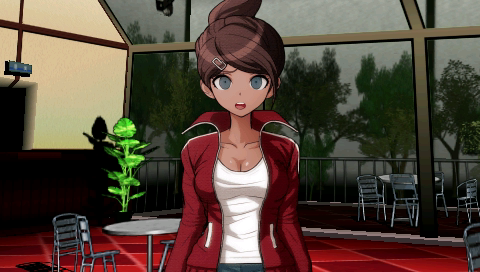 ...So, what's your type, Naegi? What kind of girls do you like?